This takes a little planning prior to the wedding, but these wedding scrapbook ideas for your wedding guestbook will be another album you will cherish forever! Plan out how you would like the layout of your guestbook scrapbook. I would suggest picking a picture size (i.e. wallet, 4x6, etc) and creating mats for each guests page/or part of page. Pick mat colors of your choice. If you would like to keep with your wedding's theme, choose your wedding colors. Or feel free to be random and insert your favorite colors! Please note if you use the "Favorite memory of the couple" and/or "Advice to the couple" this will take time, so if you have a large guest list you may not want to include this in your guestbook. However, if this is something that you really would like to have, make separate cards and lay them on the reception tables for your guests to fill out. I would suggest having two guestbook attendants...one to answer questions regarding the book, as well as to line each group up for a picture and the second person can then be in charge of taking pictures. If you will be using a digital camera, be sure to have plenty of extra batteries. If you are using film...consider the disposable cameras. That way the guestbook attendants will waste no time reloading the camera. Another advantage with using disposable cameras is that you can number each camera beforehand and after the pictures are developed you will have an idea which section of the guestbook belongs to each group of pictures. After the honeymoon is more like it...unless your guestbook attendants volunteer! 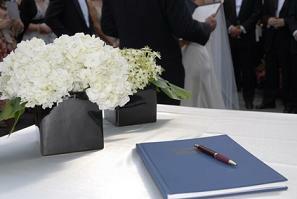 Mount the pictures to the prepared pages of the guestbook. If you would like, continue to embellish the pages and add short journal entries regarding the pictured guests. Also consider inserting beautiful and relevant Bible verses. Using these wedding scrapbook ideas for your wedding guestbook will create a guestbook that will be enjoyed throughout your marriage! Browse some supplies to make your guestbook scrapbook perfect. Just click on the picture for more information. Have You Created A Scrapbook Page of Your Wedding? We would love to see your "I Do" scrapbook pages! Share them here!